SO OFTEN IN MY LIFE, the adventures I’ve been fortunate to experience have started with questions. For example, “What’s over that ridge?” or “Can I climb that mountain?” The beginning of my adventure for Alaska-Yukon moose was no different. Voermans’ grandfather, Pat McVay, packing out his trophy near Yantarni Bay on the Alaska Peninsula, 1976. To this day, I’m not certain whether my grandfather meant that as a challenge or a warning. What I am sure about is that he had a solid understanding of how to motivate a 17-year-old boy. 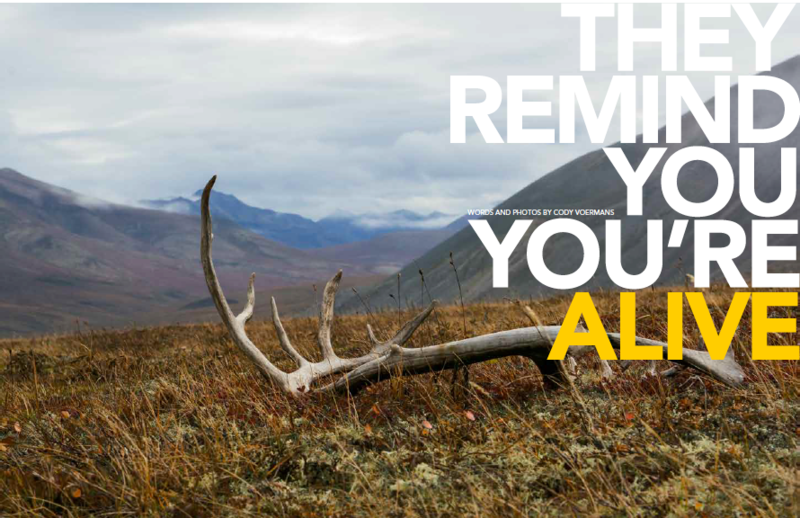 His words poured fuel on my growing passion for arctic hunting, and from that day on, I did more than dream of a northern moose hunt. I researched hunting areas and outfitters, read every available text on moose and moose hunting, and saved every extra dollar. Choosing an outfitter was the easy part. 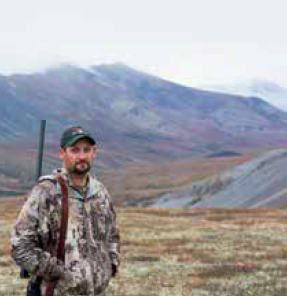 At the time, my good friend Tavis (Tav) Molnar was a guide for Arctic Red River Outfitters in the Northwest Territories of Canada. 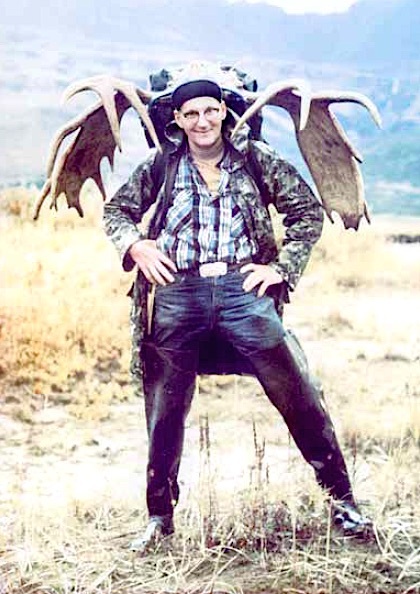 Each winter after the hunting season, he would recount wild stories of trophy moose living too deep in the Mackenzie Mountains for even the most intrepid hunters to reasonably pursue. He joked of remote giant bulls sporting huge antlers that defied the laws of gravity and forced them to walk backward, dragging their heads under the weight. Tav was and is an expert storyteller, and he constantly fanned this fire by describing the giant bulls of the Arctic Red River and assuring me that I could be the first hunter crazy enough to pursue them on foot deep in the mountains. It didn’t take many stories for Arctic Red River Outfitters (arcticred-nwt.com) to become the only choice for my future moose hunt. The hard part was saving enough money. Through my college years and for many years after, the cost of a moose hunt grew faster than my bank account, and my goal seemed hopelessly out of reach. Fortunately, my college degree led to a good career, and my savings caught up to the cost of a moose hunt 20 years after I first set my mind to the goal. Coincidentally, it was about that same time when Tav purchased Arctic Red River Outfitters and began running the business with his wife and two young sons. Finally, the stage in life was set for my own wilderness moose hunt. My trip was planned for the middle of September, and Tav allotted 10 days for the backcountry hunt. Unfortunately, the responsibilities of outfitting wouldn’t allow him to accompany me, so he assigned Kevin Wheale, one of his best and most ambitious moose guides, to lead the adventure. On a windy September evening, Tav landed Kevin and me by way of Super Cub airplane in an area east of the Arctic Red River. Our plan was to hunt along the front range of the Mackenzies and move our camp as we traveled. If and when I took a moose, we would then spend the remainder of the 10 days searching for an acceptable airstrip, or even building one, large enough for the Super Cub to land and then move us back to base camp. Heavy fog and steady rain delayed that plan for the entire first day of the hunt. The rain was of little matter, but the thick fog that came with it reduced visibility to less than 50 yards and stole any hope we had for moose hunting. On the second morning, the fog was still hanging low but periodically lifted enough that we could see the lower slope of the mountains. Both Kevin and I figured that was enough visibility for us to hold a general direction, and shortly after breakfast we began hiking east along a creek bottom with our 50-pound packs. There was no hope of spotting a moose at any distance beyond 100 yards in the dense haze, but at least we were moving and it felt like we were hunting. All day, Kevin and I slogged through tundra marshes and across the boulder fields of washed-out creek bottoms without ever seeing past a couple of hundred yards. Throughout the hike, the only time the view changed was when we switched who was hiking in the lead. For seven hours, we hiked through the fog along the base of the mountains and finally reached the crest of a flat-topped ridge that provided a level campsite. Both of us were tired and intensely frustrated that two full days of moose hunting had passed with no hope of spotting a bull. That frustration was short-lived. As Kevin and I set up our camp, the fog began to lift and slowly exposed a large open valley below and the towering peaks of the Mackenzies beyond. In the haze, Kevin and I had unknowingly placed our camp in the front row of a wilderness theater with a spectacular view. On one side of our camp, the jagged crags of the Mackenzies rose up to spectacular heights. Their treeless peaks stabbed at the rising clouds with serrated edges of ancient granite. On the other side, gentle rolling hills covered with dense spruce stretched out peacefully as far as the eye could see. In between, as if Mother Nature herself struggled with indecision, Kaleb Creek rumbled through a sharp cut on the near side of the valley, and beyond that the valley flattened out to a 2-mile-wide rolling oasis dotted with spruce groves, shallow lakes and willow thickets. The view was enough to make the adventurer in me stop in awe and the hunter in me smile with anticipation. Our camp overlooked an expanse of prime moose habitat that held enough promise to quell all frustration from the first two days of the hunt. In the evening, the weather continued to change for the better. The fog dissipated, the wind died off to nothing, and the temperature began to fall. A large bull caribou fed across the ridge within 100 yards of our camp. His appearance indicated that animals were on the move after the last two days of rain, and Kevin and I knew the next day would finally provide perfect conditions for moose hunting. Regrettably, my anxious anticipation made sleep impossible that night. Now that the fog had lifted, the first real day of moose hunting was approaching, and I lay in my tent imagining giant bulls scattered across the valley below camp. It didn’t take long for me to become frustrated with the long night, even angry at how slowly the quiet minutes passed by. My only company was the distant hiss of Kaleb Creek rumbling through steep canyons and the occasional sounds of a rock falling in the far reaches of the mountains. Luckily, my impatient vigil found a reprieve with a gentle glow that slowly illuminated my tent. Too early for sunrise, the aurora borealis was the only explanation, and I quickly dressed for a rare chance to witness the northern lights. Crawling out of my tent, the vision that greeted me was an unexpected gift. In my 20 years of planning for a moose hunt, I thought I had prepared for every scenario, but never had I imagined a light show on this scale. 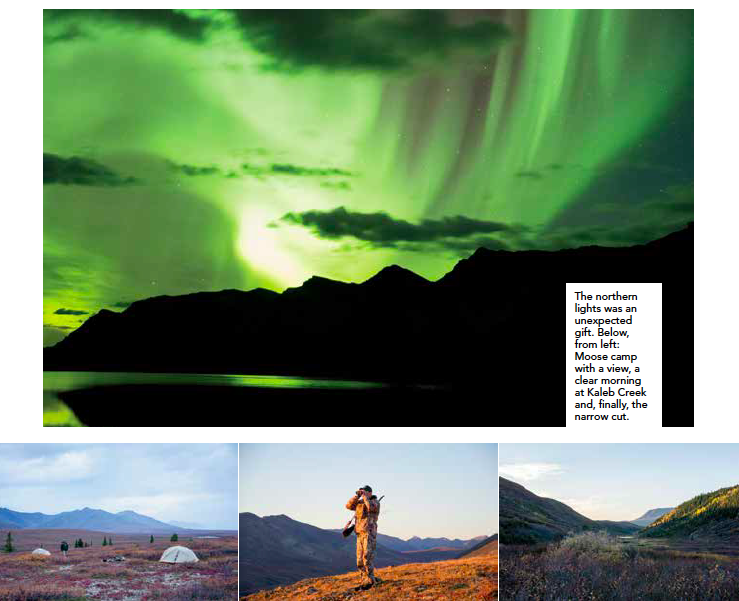 Directly above my tent and then on all sides, emerald-green streaks twisted across the sky and touched each horizon. Fluid formations of pale green with orange fringe hung over the Mackenzies like glowing curtains. They fell over the peaks engulfing our high camp from all sides and moved in churning waves as if fighting their own tide. By nearly impossible chance, a meteor shower started at the same time, and the flashing tails of countless falling stars shot through the faded radiance, adding even more wonder to the experience. I watched the lights for more than an hour, and the gently twisting glow took my mind off moose hunting just enough to allow short but restful sleep. The next morning, the air was clear and cold. A light dusting of frost lay on every surface, including the inside of my tent, and the temperature quickened my pace in getting dressed. While Kevin prepared breakfast, I hiked to a vantage point near camp with my binoculars, and within minutes I had spotted 10 moose, including three young bulls, across the Kaleb Creek valley. None of the bulls were mature, but they were the first spotted on the hunt, and it was a good start to the day. The majority of the moose were feeding about 3 miles east of our camp and concentrated around a large willow flat near the entrance of a small canyon. This canyon in particular was a long, narrow cut about 400 yards wide that was choked with willows at the bottom. It extended about a mile to the east and connected our valley with a small basin honeycombed by shallow lakes. The narrow canyon had steep sides and was a naturally protected corridor for moose traveling between our valley and the far basin. When I returned to camp, Kevin had prepared a breakfast of freeze-dried scrambled eggs and hot coffee. Sitting down to eat gave us a chance to discuss our plan for the day. With the moose activity generally focused in one area, we both thought that hunting in the direction of the narrow canyon was our best option. The only problem was getting there. We would have to break camp and descend from our high ridge toward the far side of Kaleb Creek. From there, we could find a new place to camp and continue the hunt with lighter packs across the valley. “Well,” said Kevin, “we won’t get a bull from this ridge. Let’s hit it.” Within the hour, wewere loaded and headed down a steep ridge toward Kaleb Creek. It took us half the day to move our camp to a low ridge on the far side of Kaleb Creek. Even though we had hiked under the load of our camp gear for four hours, we wasted little time grabbing light gear and a few candy bars before heading off across the remaining 2 miles between us and the narrow valley we had seen that morning. Within a few hundred yards of the new camp, our ridge melted to a long tundra flat, and I realized that the Mackenzie Mountains had played a cruel trick on us. The inviting valley floor we had looked over that morning turned out to be a maze of tussock grass. Knee-high grass clumps, randomly spaced over soft muskeg, extended in all directions. Similar to walking on a giant sponge covered with bowling balls, a few steps were solid, but the rest sank us in to the knee and burned our hip muscles with each pull. Add dense willow patches with flowing water in between, and the hike became more of an obstacle course than a hunt. Seeing a big bull changed our demeanor from frustrated hikers to focused hunters, and we immediately started searching for stalking routes. The bull was feeding in the bottom of the narrow valley, and the wind was cutting a sharp angle across the top. After a short discussion, we decided our best option was to wade through the swamp at the lower end of the cut and traverse the steep canyon wall on the far side. From there, we could use the rim of the canyon as cover to close the distance from the downwind side. “Time to go,” said Kevin, and he quickly led the way off the west rim. Our plan seemed simple, but the Mackenzie Mountains are much like an attractive woman. They’re never as approachable as they seem from a distance. When I reached the swamp at the bottom of the canyon, Kevin was already halfway across and struggling to get over a beaver dam. I saw him sink to his hip in a mud hole and thought to myself, The best laid schemes o’ Moose an’ Men …. Fortunately for me, Kevin did a test run on every hazard in that swamp, which enabled me to avoid them when I crossed. I wasn’t so lucky on the far side, however. The steep face of the opposite canyon wall was challenging for both of us. The soft, wet moss on the grade was poor footing, and each step slid us back more than half the distance it was intended to gain. Short willows provided some traction, but they were sparse over the slope. Climbing up through the areas with few willows, I lost count of how many times my feet slipped and I fell against the hillside. Poor footing made our climb twice as difficult as I expected it to be, and halfway up, my quadriceps were shaking from the extra strain. Reaching the top of the ridge, we eased through scattered spruce and more tussock grass, constantly checking the wind as we went. Two hours of careful progress along the rim passed before we slipped over the lip of the canyon and spotted the bull below. Our stalk had been perfect, and we found ourselves 200 yards above and downwind of the moose. During our approach, the bull had bedded down, and at that moment he was sound asleep at the bottom of the canyon. 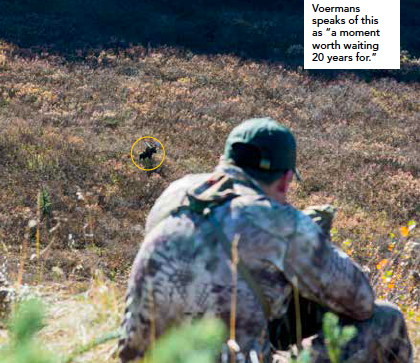 Kevin and I sat hidden by low willows on the ridgeline and waited more than 20 intense minutes for the bull to stand. In that time, we studied every inch of his antlers. Each of his wide palms, lined with tines, swept back past his shoulders and left no doubt that this was one of the mountain giants Tav had often spoken of. When the bull finally gained his feet, I was ready, but he quickly turned and started feeding away from us without presenting a decent shot angle. Usually, feeding animals will present a broadside shot as they randomly turn to grab mouthfuls of what they are grazing on, but this bull was feeding on a strip of willows that led straight away from our position. There was no reason for him to turn as he fed, and it quickly became apparent that the bull would show us nothing but his tail before moving out of rifle range. Kevin saw this, and when I started tracking the bull with my rifle, he asked if I was ready. Before I could answer, he let out a long, guttural cow call, hoping the bull would respond and turn broadside. The moose responded instantly. He stopped feeding and twisted his head around to look back in our direction. Most of his body was still facing straight away from us, and I didn’t have a clear shot at his chest. He stood there motionless for a few seconds, and that gave me a chance to settle my breathing. When I saw his front leg step back slightly, I knew he was turning to the right, and I settled my cheek on the rifle stock. Through the scope, I watched the bull turn broadside into my sight picture, but before I could shoot, he continued to turn all the way around and began walking back toward us, grunting with each step. Now the bull was straight on, and once more I didn’t have a good shot at his vitals. The bull plowed through the tall willows straight toward us and closed about 50 yards before Kevin asked again if I was ready. This time I answered, “Yes,” but the bull, now intent on our location, heard our words. Immediately, he stopped short, whirled and began trotting across the valley, angling away from our position. I wasn’t interested in shooting at a running moose, especially not one moving through thick brush. So, I lifted my head off the rifle and waited. When the bull reached the middle of the valley floor about 250 yards away, he crossed an area covered with shorter willows that just reached his belly. With the bull in the open, Kevin let out another long whaahh, and this time the moose stopped quartering away just enough to expose a narrow section of his chest. I knew the bull wouldn’t pause long, maybe only a few seconds, before realizing Kevin wasn’t a cow moose and continuing his run. Quickly, I snugged the rifle against my cheek for the third time and concentrated on the narrow crease behind the bull’s shoulder. At that sharp angle, the margin of error was small, but it was my only chance. I settled the crosshairs low in the crease over the bull’s heart and gently squeezed the trigger. Instantly, I heard the unmistakable thump of the bullet hitting home, and before I could reload, the bull was down in the short willows. The entire sequence lasted only a few moments, but it was a roller coaster of patience and action that left me shaking with adrenaline. I reloaded the rifle and tried to stay calm for the few minutes necessary to make sure the bull was down for good, but it was a losing endeavor. With each passing second, the certainty of my shot grew, and so did the trembling in my hands. When I saw the bull move for the last time, euphoria overtook my composure, and I leaned back against a soft cushion of moss and willows, letting the hillside support my shaking arms. I lay there, silently watching orange willow leaves dance in the light breeze above my face, and felt cold tears welling up in the corners of my eyes. I thought back over the 20 years of dreaming and determination it took to get to this moment, not at all ashamed of my emotion. These weren’t tears of sadness. 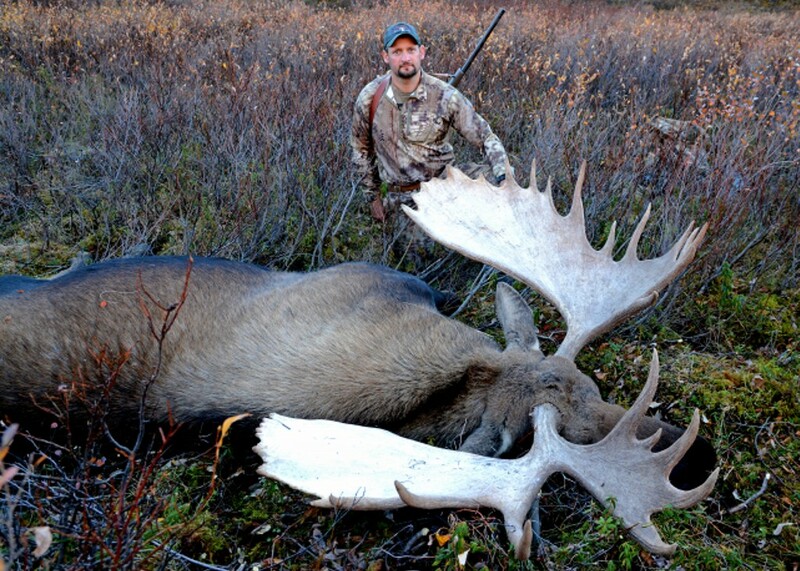 They were pure respect for a great bull, the sheer wildness of his home and the struggle that embodies moose hunting. As I lay there, Kevin was silent as well. While he makes his living guiding hunters to northern game, he doesn’t do it just for the money. Like me, he carries a respect for the animals and an admiration for the experience of the hunt that overshadows the kill. Kevin let me have those moments to myself, and when my hands stopped shaking, the two of us gathered our gear and made our way down to one of the finest trophies I have ever taken. In the bottom of the canyon, Kevin and I struggled to push through a tangle of willows that stood above our shoulders. These were the same willows the bull had towered above and charged through a few minutes earlier. The comparison left me wondering how big these animals really are. When I finally stood next to the moose, the sight of him lying there answered the question. This bull was huge, a trophy by any measure. 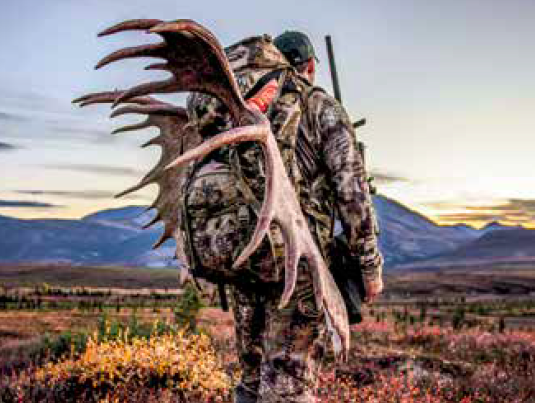 His antlers stretched more than 60 inches wide, and each palm carried 16 points. I stood in awe of his massive body, which stretched 12 feet from nose to tail. His chest alone was 4 feet deep, and his long legs had helped him stand higher than 7 feet at the shoulder. I felt simply insignificant next to him. Kevin and I spent a long time admiring the bull and taking pictures, but the reality of our situation was rapidly sinking in. In front of us was a 1,200-pound moose, and behind us lay a vast sea of tussock grass and thick willows. It was late in the afternoon, and the sun had just disappeared behind the mountains. We were facing a three-hour job cleaning the moose and then a three-hour hike back to camp. Neither of us needed to look at our watches. The lengthening shadows in the bottom of the canyon caused us to put down the camera and pick up our knives. We had to get the meat off the bull and our packs loaded in time to climb out of the canyon and get a line of sight on our camp before dark. There were no lights on our tents to guide us 3 miles across the valley. Kevin started skinning the shoulders of the bull while I skinned the back half. I was surprised again at the size of his body and found it impossible to lift a hindquarter by myself. Kevin and I had to strip the meat off one side of the bull as it lay and then roll him over to continue on the other side. It took us three hours to complete the job and secure all the meat in game bags. We now faced the difficult decision of picking a route back to camp. The sun had already set, and the long shadows meant we didn’t have time to travel down the gentle grade of the valley and climb out before dark. Our only option was to hike straight up the steep wall of the canyon toward the ridgeline above. I mentioned to Kevin that I wanted to pack the antlers out on the first trip and didn’t finish the word “antlers” before he said, “You bet, man; they’re all yours!” He was surprisingly willing to give me that job, and it didn’t take me long to realize that moose antlers are terribly awkward on anything except a moose. Our path took us up 300 yards of unforgiving canyon wall. The grade was steep enough that I could stand, reach forward and touch dirt. For most of the climb, I had to crab walk up the slope on all fours and fight the swaying antlers to maintain my balance. Before I reached the ridgeline, my legs were cramping and my shoulders burned under the load. My body reminded me that I had already moved my camp off a high ridge, crossed a large stream and negotiated swamps and tussock grass, and now I faced the same all over again. It’s times like this, forcing one foot in front of the other, that are often overlooked by those who merely dream of experiencing a northern moose hunt and are never forgotten by those who have done it. We reached the rim of the canyon just in time to catch the last hint of alpenglow on the peaks. The Mackenzies rested in a purple hue that crept down the ridgelines and engulfed the fall colors on the tundra below. Standing on that ridge while feeling the weight of the antlers firmly on my shoulders and watching the last light fade over the mountains was one of the most intimately powerful moments of my life. I looked 3 miles across the valley at two tiny orange dots that could only be our tents, and I was reminded of these words from Theodore Roosevelt: “The credit belongs to the man who is actually in the arena.” While I may have been a tiny speck in the expanse of the mountains, right then, on that ridge, the credit belonged to me. Twenty years of dreaming and planning had culminated in the events of a single day, and I began to realize, as my grandfather had, that it’s determination and the physical effort of a moose hunt rather than the kill that are at the heart of the adventure. In total, Kevin and I made four trips over two days to that canyon. Together we hauled 800 pounds of moose meat, antlers and cape over 3 miles to a ridge long enough to accommodate landing the Super Cub airplane. Each load, significantly over 100 pounds for each of us, did more than strain my shoulders and bruise my hips. The weight pushed permanent boot tracks into my memory that will always remind me that I am alive.